So, since I can see what people are searching for now, I can see when people search for something like “Dio Fan Art”- Dio, of course, referring to Ronnie James Dio, 70’s and 80’s metal vocal legend. We felt bad that someone had come to our door seeking something so unimpeachably awesome and left empty handed that we decided to combine our collective talents and technologies to give the interwebz what it really wants. Before I set out to make my “masterpiece” I decided that I needed to refamiliarize myself with the work of Mr. Dio, since the last time I heard a song by him was when I last played Guitar Hero Encore: Rocks the 80’s in 2007. I found the music video for Holy Diver and there was this flash of some kind of evil warrior thing so I drew it. I was channeling my inner 7th grader and thought to add some demonic clouds, plus I also had to draw the logo, duh. If I was a middle schooler in the 80’s this is exactly the kind of doodle I would want on the cover of my science notebook. Art by Cody Bromley. This is clearly awesome. Extra "Soul of the Damned" points for those most excellent demonic clouds and the use of freakish "Ye Old Satan" font. Helen the Managing Editor – iPad 3 with stylus, Doodle Buddy App, Photo+ App. The internet defies logic sometimes and I like to procrastinate. 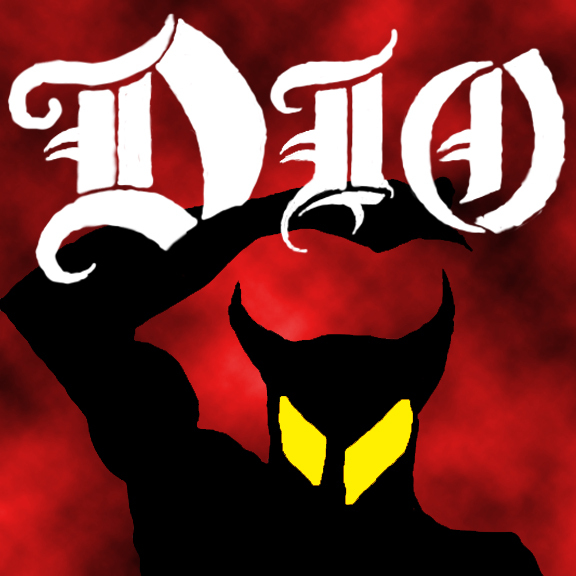 So instead of writing a review of the new M.Ward album “A Wasteland Companion” like I’m supposed to, I seized the opportunity to suggest that we give the internet what must be so hard to find that it brought someone to a random Okie website under the search term: Dio Fan Art. Now I kind of know who Dio is, but only in that I know he was in Quiet Riot (no he wasn’t) and some other metal bands (this part is true, actually). But to be honest, I had to go Wikipedia Ronnie James Dio because I know very little else about who he was outside of accidentally catching one of his bands’ videos on TV (probably on VH-1 back in the day when channel surfing and landing on shows like “I love 80s” or “Where Are They Now”). Like did you know he was the frontman for a band called Rainbow? I didn’t. What’s more he wrote all the band’s lyrics from 1975-1979. Do you know why he left that band? Because they wanted to go in a more commercial direction and distance themselves from their “sword and sorcery” background. Dio apparently did not like this and left. Oh, damn these artists and their commercial vs creative differences! Anyway, since I am not a Dio fan, I had to really think about this totally bogus assignment I invented for us. “What would a real Dio fan make in terms of expressing their love with their art?” Sadly, in the 5 minutes I gave myself to brainstorm, the only thing I could think of was someone trying to capture the memory of their first Dio concert. But alas! I was born in 1981 and this band broke up 2 years before I even set eyes on the world. So using my powers of time-teleportation, I went back to catch their 1977 concert in Munich. It was awesome! I took so much acid, though. Things got hazy. Wisps of memories sometimes flash before my very eyes and then I question my grip on reality. But that rocks!!! Whoo!!! 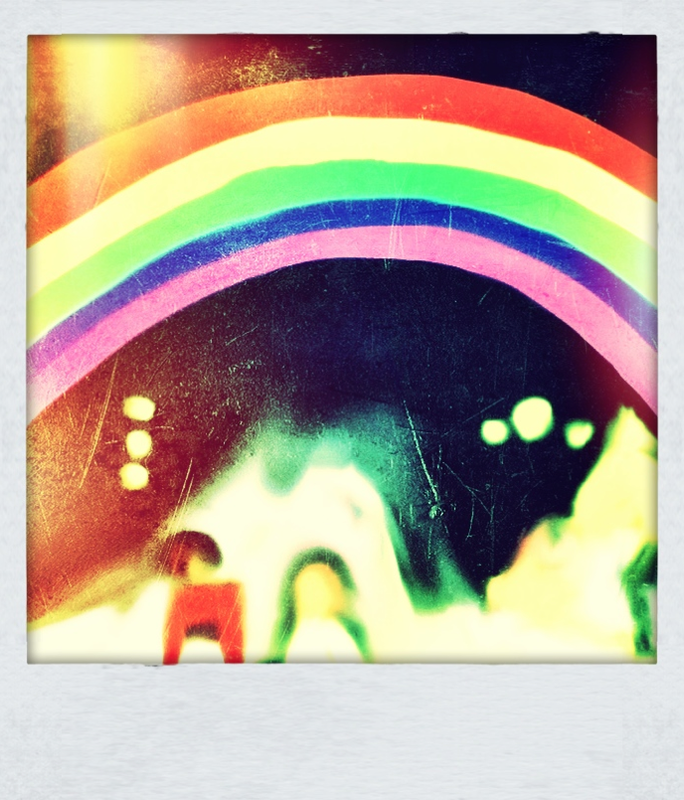 Luckily, I have this Polaroid to sum up the magic of watching Dio work the crowd into a rockin’ medieval frenzy. That Rainbow they used for stage decor was so magnificent it ate up all the power and sometimes the band’s instruments and sound system would cut out because of that during this concert. It was trippy. I know because I was there and not because I found some picture on Wikipedia that said this is what happened. Man, the only thing that would have made this night better is if it'd been a Double Rainbow. Talk about EPIC! Art by Helen Grant. Colin the Executive Editor – Sharpie, highlighters, paper, and the power of rock. 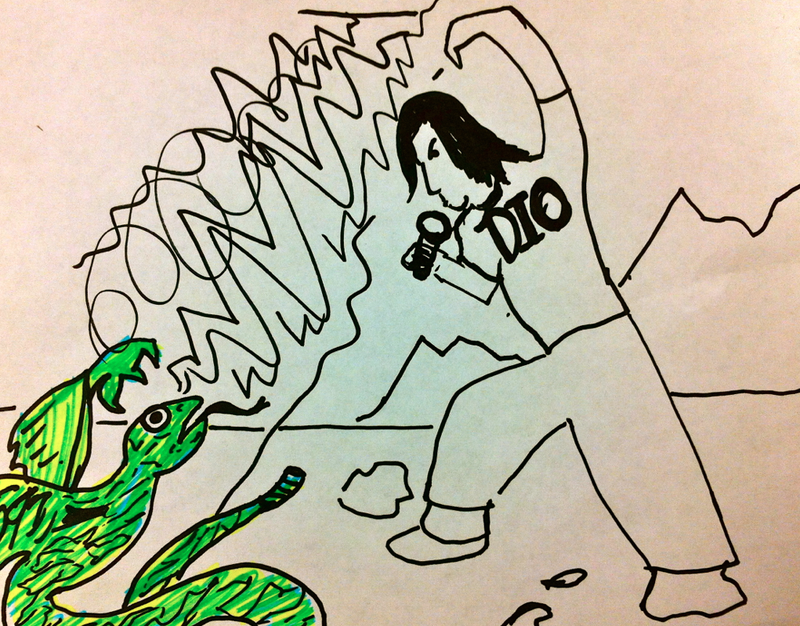 I was doing other things, but I didn’t want to disrespect, so I popped off a quick sketch of Ronnie James Dio defeating a winged serpent in a post apocalyptic hellscape using nothing but the power of rock. 1) This is the most ridiculous thing we have ever published. 2) I have the most art education of all of us, and mine is the worst by far. The fact that I spent under 2 minutes on it doesn’t make it any better. “Couldn’t draw the greatest drawing in the world, no this is just a tribute!” Art by Colin Newman. Editor’s Note: Our Special Projects Editor, Daniel Page, is a massive fan of 80’s metal. So much so, that we are sending him to Rocklahoma. He is actually wearing a Motorhead shirt in the office as we speak. When he heard about this project, he created a piece of his own that was not part of the original exhibition of Dio fan art. The following is his creation and artist’s statement. Daniel Page the Special Projects Editor – Crayola Crayons, Sketch Pad, Black Sabbath’s first album with Mr. Dio, “Heaven and Hell” that he politely asked Helen to play on her computer. 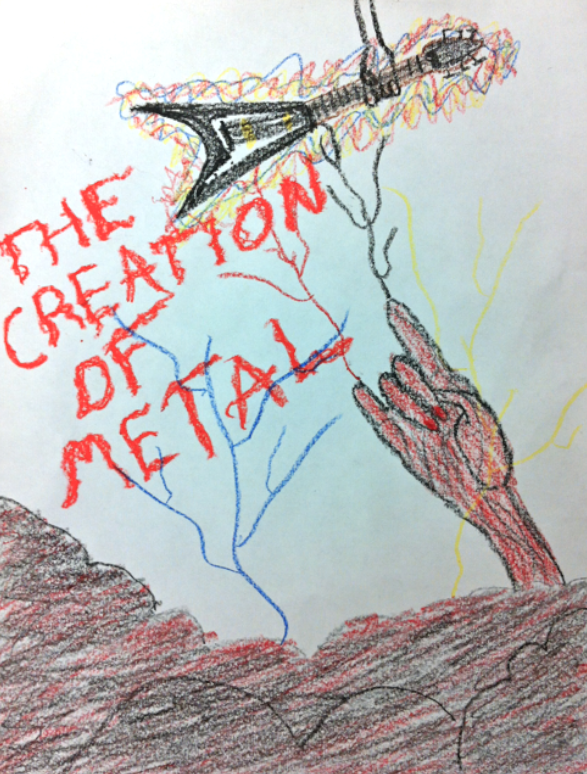 The piece I created is entitled “The Creation of Metal”. It is, of course, inspired by Michelangelo’s Sistine Chapel piece “The Creation of Man”. However, instead of God’s hand reaching down to Adam from the Heavens, there is a demonic red hand reaching up from the nether-world, and using his two-fingered salute to imbue a Gibson Flying-V held by an ambitious rocker with the power of metal. The multicolored lightning coming up from the clouds below is representative of the potency and grandiosity that is characteristic of the genre. This would be such a bad tattoo. No offense Daniel. Art by Daniel Page. Tagged bands, Dio Fan Art, Doodle Buddy App, Managing Editor, Photo App, Quiet Riot, Ronnie James Dio, Special Projects Editor Crayola Crayons, Whoo Luckily, Wikipedia Ronnie James Dio. Bookmark the permalink.